This volume contains a wide selection of famous musical themes from Bach to Carl Orff. Each piece is followed with a jazz interpretation, which can either be played alone or alongside the ´original´ version. Perhaps this will show that the ´classics´ are not all that far removed from jazz. Doesn´t Lully´s ´Gavotte´, for instance, contain one of the most famous jazz themes ever? The theme from Mozart´s Sonata in A major doesn´t require many rhythmic changes to give it a blues flavour. The driving rhythm of the ostinato bass in Carl Orff´s ´O Fortuna´ would suit modern jazz-rock performers well, with a few small changes. What do Bizet´s ´Habanera´, Brahms´ ´Hungarian Dance No. 5´ and Paganini´s ´Caprice No. 24´ have in common? Why have they been turned into salsa music? Much of this is up to the individual: if you want to discover similarities, they are easy to find. 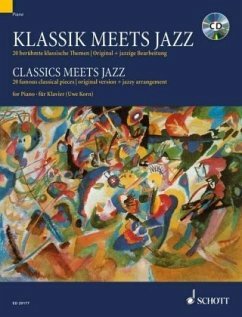 Klassik meets Jazz, für Klavier, m. Audio-CD bei Amazon.